Are you ready for relaxation and a whole lot of fun? 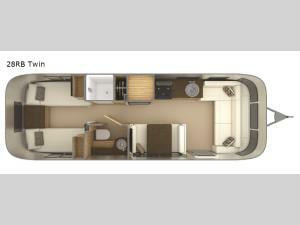 You will enjoy all of the room inside this Airstream Flying Cloud 28RB travel trailer! Along the front you can visit with your family and friends at the front sofa. With the fully functional kitchen you can create the meals that your family enjoys most! As you head toward the rear there is a split bathroom with a shower along one side of the trailer and across the hall you will find a private toilet area with a sink. In the rear bedroom there is are two twin beds where you can rest up before your day of adventure!